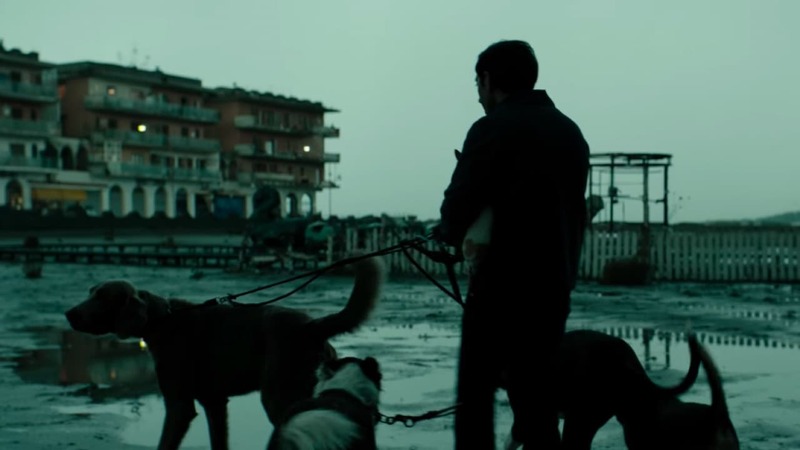 This is the new feature by Matteo Garrone, the director of the 2008 Gomorrah, a powerful drama about members of a crime organisation in the Naples area. This is also in a way a crime film but with a rather different type of plot; it shares the downbeat tone and resolution of the earlier film. This new title is set in an outer suburb of Rome close to the River Tiber. This is a small run-down enclave with a plain square, a few shops and businesses and a number of high-rise flats. The central character is Marcello (Marcello Fonte), the ‘dogman’ of the title. He runs a small and basic dog parlour offering both grooming and shampoos with some boarding accommodation. The latter is very basic as is the exercising of the dogs which we see at one point. The canine performers are only part of the setting for the film, though we see quite a lot of them. Marcello’s own dog is Jack, a cross-breed. He has slightly more to do then the varied breeds seen in the parlour but he is not a fully developed character. This treatment is reserved for Simoncino (Edoardo Pesce), a great hulk of man, an ex-boxer who appears to have suffered mentally from his occupation. Simon terrorizes the local community. It seems he is repeatedly jailed for minor offences but only for short periods; then returning to carry on his antisocial behaviour. Marcello is part of a business/friendship circle at a local bar where the men discuss ‘dealing’ with Simon, but go no further. Because Marcello, as a side-line, provides Simon with cocaine he has more dealings with him. And it is this relationship that leads to the more and more problematic situation. Whilst Marcello vainly tries to avoid increasing involvement in crime he also cares for his daughter who lives with his separated wife. I assumed that the holidays they take together, underwater explorations , are fuelled by his drug dealing. 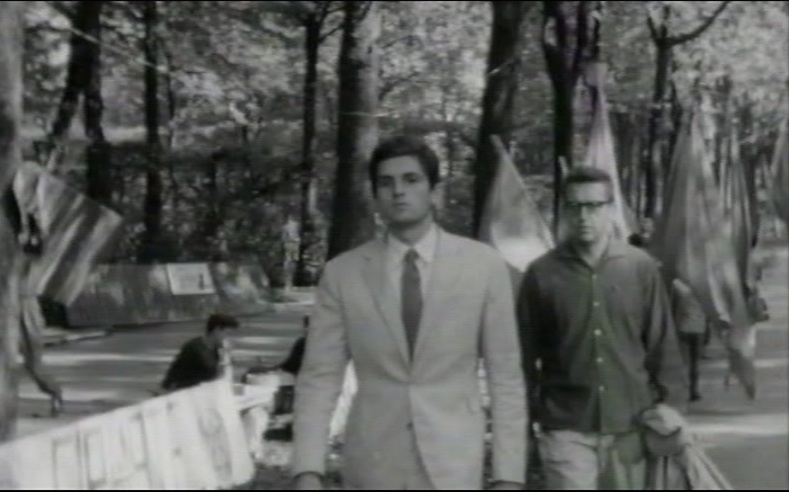 Marcello’s path is downhill all through the film. He struck me as the ‘biggest loser’ I have ever seen in a film, venturing into actions that screamed disaster, if not to him then certainly to the audience. The climax of the film comes when he has to confront his unequal relationship with Simon. This includes what can be seen as a ‘compulsory scene [one that the audience becomes increasingly impatient for]. Michele Braga sparse music adds to this feeling of grim reality. The screenplay is the work of a trio, Ugo Chiti, Matteo Garrone, Massimo Gaudioso, who also wrote Gomorrah; and there are four other writers credited as collaborators. The way the story intertwines the characters and the places is excellent and the narrative works up to a powerful climax. This focuses totally on Marcello and Simoncino, leaving us little wiser about the daughter or the other in habitants, who remain predominately ciphers in the story. The film offers a strong realist feel to place and characters though the plot tends more towards melodrama. This is a fine piece of film-making though it is as downbeat as a film can get. It has the tragic feel of some of the classics of earlier decades, including those from neorealism. The film is in colour and in a ratio of 2.35:1 circulating in a 2K DCP. The print in Britain has English sub-titles. I saw the film at the Tyneside Cinema, my first visit. This is a multi-screen independent. It is impressive how they have fitted all the facilities into the one building. And the venue offers a varied and interesting programme. Antonioni was born in 1912. In the 1930s he experimented with 16-mm film and also contributed film criticism to a local newspaper. In 1940 he attended the Italian film school Centro Sperimentale di Cinematografia. He then worked as a scriptwriter, including on one film for Roberto Rossellini. His first film as a director was a short documentary, Gente del Po, on which he worked from 1943 to 1947. In the 1950s he directed a number of features and continued as a scriptwriter, including contributing to Fellini’s The White Sheikh/Lo Sceicco Bianco (1952). In 1960 L’avventura bought him international success. The film won the Special Jury Prize at the Cannes Festival. It formed a trilogy with his next two films La notte, winner of the Best Film Award at Berlin in 1961: and L’eclisse, which also won the Special Jury Prize at Cannes, in 1962. All three films starred the actress Monica Vitti; almost as regular in Antonioni’s films as was Giulietta Masina in Fellini’s. Antonioni was clearly seen as an auteur. His dominant theme was the emotional barrenness of modern man – the futile search to assert him or herself in a technological world and their frustrating inability to communicate with others. Ephraim Katz comments “Long lingering shots follow his characters until their inner selves are revealed. By their leisurely immobility the shots suggest the overbearing pressure that times exerts upon human emotions. The surrounding physical world is also used to convey a state of mind and to express the strains of alienation and psychological agony. Antonioni’s films are almost plotless, their narrative vagueness almost bordering on mystery. “ [In the International Film Encyclopaedia, 1994]. 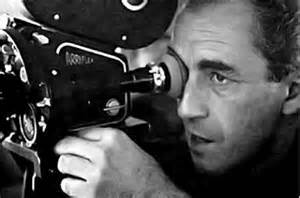 Antonioni grew up under Fascism and his early filmmaking career paralleled the development of Neo-realism. These films focussed on the lives of ordinary people. Neorealist used location shooting, non-professional actors and a somewhat unconventional style compared with mainstream studio films. In the 1950s Antonioni’s films moved away from the Neorealist aesthetic and began to display the visual and narrative ambiguities of his most famous films. At the same time changes in cinema audiences and film exhibition impacted on Italian filmmakers. These were part of wider changes in international post-war cinema. Cinemas, especially in rural areas and small towns, frequently closed. City based cinemas survived but prices increased. Moreover there developed what we now call ‘niche’ audiences. There were the mainstream popular films, including imports from Hollywood, And there were ‘quality’ or art films. The latter often made a virtue of black and white cinematography, which generally cost less. But it also provided a distinctive style as colour became the norm in the mainstream . Antonioni only made a colour film, The Red Desert / Il Deserto Rosso in 1964. Along with the style went a distinctive approach to plot, character and the resolution of the film story. L’avventura, La notte and L’ecclise form a thematic trilogy. Antonioni made them between 1960 and 1962. All won festival awards, and they established his reputation and his directorial persona. Monica Vitti appears in all the films. Antonioni together with Tonino Guerra wrote the scripts. Eraldo Da Roma was the editor on all three films; Gianni Da Venanzo was director of photography on La notte and L’eclisse; and Giovanni Fusco composed the music for both L’avventura and L’eclisse. In the same period, apart from Fellini’s La dolce vita, Igmar Bergman directed Winter Light; and Alain Resnais directed Last Year in Marienbad. All great modernist films. In L’avventura “A young woman, Anna [Lea Massari], disappears while cruising near Sicily in the company of a group of rich Italians. Her lover, Sandro Gabriele Ferzetti], and her friend, Claudia [Monica Vitti], search unsuccessfully for her, developing a tenuous relationship in the process. There is no resolution of the conventional type. Anna’s disappearance is never explained and ceases to be of nay interest. At the end of the film Claudia and Sandro achieve a bleak sympathy, but hardly a consummation. Nor are we permitted any semblance of orthodox narrative involvement. The film is paced very slowly, much of its action is seen in real time. Its characters communicate little dialogue, and more often than not, are to be found looking away from each other into the bleak and arid Sicilian landscape.” [Andrew Tutor]. La notte “is about an artist’s life at the height of Italy’s economic miracle; it depicts several hours, including the whole night, in the life of Giovanni Pontano [Marcello Mastroianni], a novelist, on the day of the publication of his latest book. Jeanne Moreau plays his wife. And Monica Vitti plays the daughter of an industrialist whom Giovanni attempts but fails to seduce. 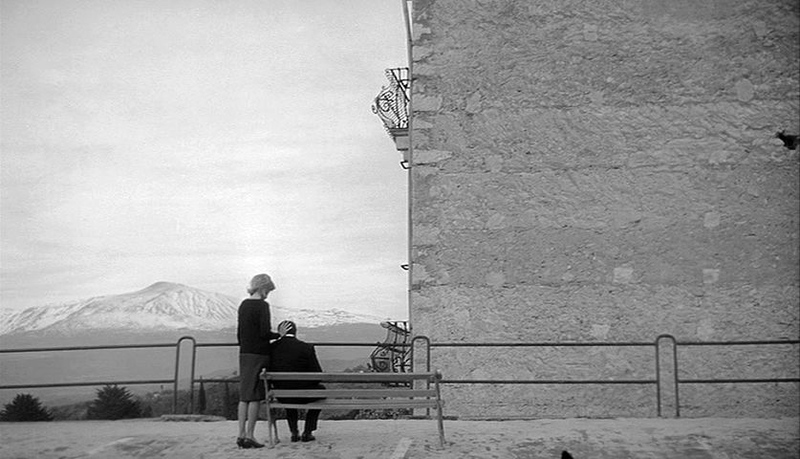 Antonioni manipulates entrances and exits and ambiguous shifts of scale, in order to shift regularly between his principal characters while maintaining the impression that their independent actions are linked together, almost as if they see each other in their privacy.” [P. Adam Sitney]. 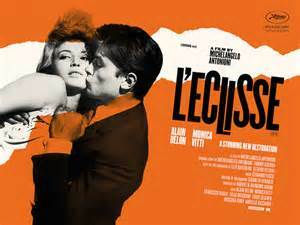 L’ecclisse is set in Rome and the central relationship involves Vittoria (Monica Vitti) and Piero (Alain Delon). The plot involves the city’s Stock Exchange whilst the settings are mainly in the upmarket and fashionable EUR area of Rome. The film is [for my money] the most abstract of the trilogy. The film is set in two areas of Rome, though there is also a light aeroplane flight to Verona aerodrome. The prime focus is in the EUR district where Vittoria lives in a modern, smart apartment. EUR was a project of the 1930s Fascist regime. It was to be an architectural and planning monument constructed round a great expo Exhibition. The exhibition never took place and the area was developed post-war as both a residential and business area. So the district has a mixture of styles from pre-war and post-war. And, as is so often the case in Italian films, architecture caries a particular resonance from the past. The film opens in the nearby apartment of Riccardo (Francisco Rabal) whose relationship with Vittoria is coming to an end. Later Vittoria returns to her own apartment. Riccardo vainly calls there. Later in the film Piero will call, more successfully. There is also a sequence in the flat of a neighbour visited by Vittoria and a friend. This is a somewhat oddball sequence. The hostess has lived in Kenya for a period and she is quietly racist about the black people there. The women actually play and dress up in her collection of African costumes. I find this sequence dates the film in a way that does not happen with L’avventura. The events at the Exchange feature a bubble and crash, reflecting actual economic events in Italy in 1961. There is also a sequence at the Tiber. Piero’s sports car was stolen and the driven into the river. We see the car, and the dead driver, hauled from the river. But it is followed a by a sequence when Piero and Vittoria walk across a park together. It is an exterior and a junction that dominates the last reels of the film. This is in the EUR district at a cross roads. There is an unfinished building with scaffolding and coverings: even a water running to a tank and leaking onto the road. We see this junction on several occasions. We see passerby, including a nurse pushing a pram. And at one point in the twilight a bus stops, passengers disembark and it drives on. It is here that we return at the end of the film. We see some of the passerby, including a man with a newspaper. Then the junction becomes deserted. We are waiting but never see what may happen. Visually this is a stunning sequence, with a series of shots of the junction, the building, and close-ups of detail. It also seems to be the most abstract sequence in an Antonioni film. The film is constructed round dolly shots. The camera cuts frequently, often to oblique angles. They very much service the mise en scène. Characters are placed against objects, walls and buildings. 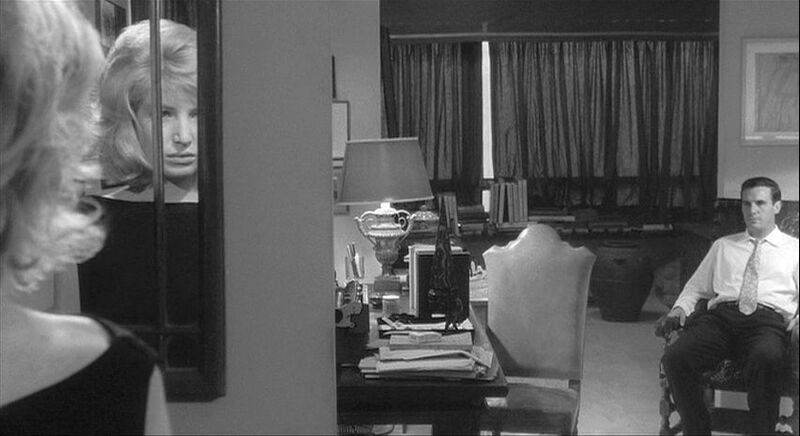 There is a shot of Vittoria in Riccardo’s flat, on the extreme left of the frame, facing into the room and a mirror. Riccardo is separated by space, walls and furniture. When Vittoria and Piero first talk at the Exchange, they converse round a large pillar as the minute’s silence proceeds. Some of the shots, especially of Vitti, reminded me of those in La Notte. The shots are not especially long. There are a number of tracks in the film and they seemed mainly to occur when there is some sort of ending occurring. We have both daytime and night-time sequences and a range of interiors and exteriors. What I had forgotten from a previous screenings was that a night-time sequence features a number of dogs. Vittoria chases these, in particular the pet of her neighbour. I cannot remember other dogs in Antonioni films? Apart from dialogue and noise the soundtrack is sparse. There are two diegetic songs and a diegetic singer. Non-diegetic brief musical phrases occur early in the film. There are more of them in a sequence where Piero shows Vittoria his parent’s apartment. But the greatest amount of accompanying music is in the final lengthy, and also most empty of people, sequence. There is no doubt that Antonioni is an auteur in themes and style. However, this is a work [as his others] that relies on the team of filmmakers involved. The cinematography by Gianni Di Venanzo is especially fine. And the production design and editing are also excellent. Whilst the sparse music by Giovanni Fusco is atmospheric. Like all of Antonioni’s films there is a high degree of ambiguity, both in regard to the characters and the plot, but also in terms of the themes it expresses. But this is certainly a modernist and alienating environment. But whilst the old centre has far more life and action it also is fairly vacuous, when it is not merely exploitative. The visual quality of the film offers great pleasure, and the sound and music add to this. It is also stimulating because whilst some viewers may be bored, [I have heard this said] if the film involves one it seems very difficult not to ponder and question after the final ‘Fine’. Italy / France 1962. Produced by Robert and Raymond Hakim. Screenplay: Michelangelo Antonioni and Tonino Guerra, with Elio Bartolini and Ottiero Ottieri; cinematography: Gianni Di Venanzo; editor: Eraldo Da Roma; sound: Claudio Mailed and Mario Bramonti; production design: Piero Poletto; music: Giovanni Fusco. Cast: Alain Delon (Piero); Monica Vitti (Vittoria); Francisco Rabal [Riccardo]; with Lilla Brignone, Rosanna Rory, Mirella Ricciardi, Louis Seignier. Screening in a DCP, black and white with English subtitles: running 126 minutes. Synopses from the Macmillan International Dictionary of Film. 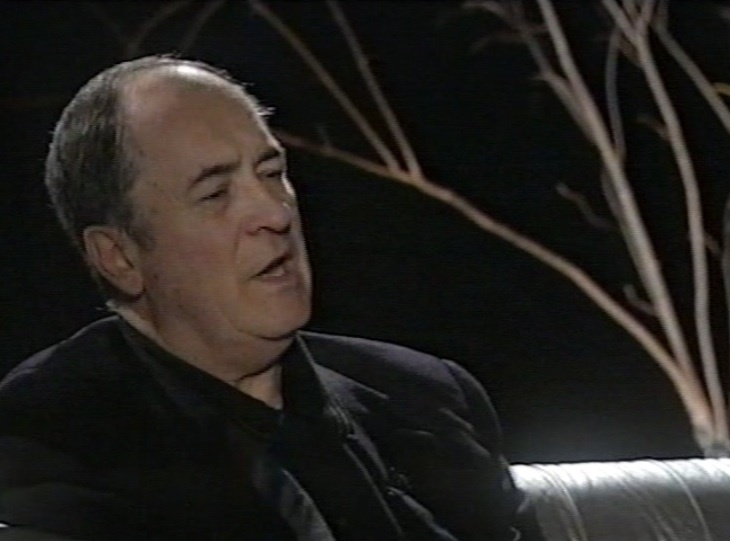 Leeds International Film Festival retrospective of his work in 2005. We saw a 35mm print of this film, made in black and white and in the 1.85:1 ratio. As usual the Italian soundtrack was accompanied by onscreen subtitles in English. Rosi had worked as an assistant with Luchino Visconti and one can see a strong influence by this director and by the Neo-realist movement more generally on Rosi’s films. At the same time there is a strong individual development in the form and style of his films in this period. The preceding film, Salvatore Giuliano (1961), a study of politics, the mafia and corruption in Sicily in the years at the end of World War II, was an amazing experience back in the early 1960s. It combined a documentary style, with dramatic plotting and labyrinthine plot full of ambiguities. This approach was to be mirrored in later films like The Mattei Affair / Il caso Matei (1972) and Illustrious Corpses / Cadaveri eccellenti (1975). Hands Over the City offers a rather different approach: the ending of the film presents something approaching closure and the resolution of the conflicts chartered through the film are quite apparent. A study edited by Carlo Testa (1996) proffers the term ‘critical realism’ for Rosi’s films. The approach developed in neo-realism can still clearly be identified, but the use of drama is modified. Rosi’s films have a critical [Marxist] approach in which the distancing [reminiscent of some of the ideas of Brecht] gives a greater emphasis to the political dynamic. Rosi comes from the city of Naples. And the screenplay was written by Rosi together with his friend and fellow Neapolitan Rafael La Capria together with Enzo Provenzale and Enzo Forcella. The city has provided the focus for several of Rosi’s films and the South is a central issue in his entire output. The South / North divide is a central contradiction in Italian history and has pre-occupied writers and artists, including the in the formidable output of Antonio Gramsci. The story presented in the film revolves around the political elite in Naples and the question of land. 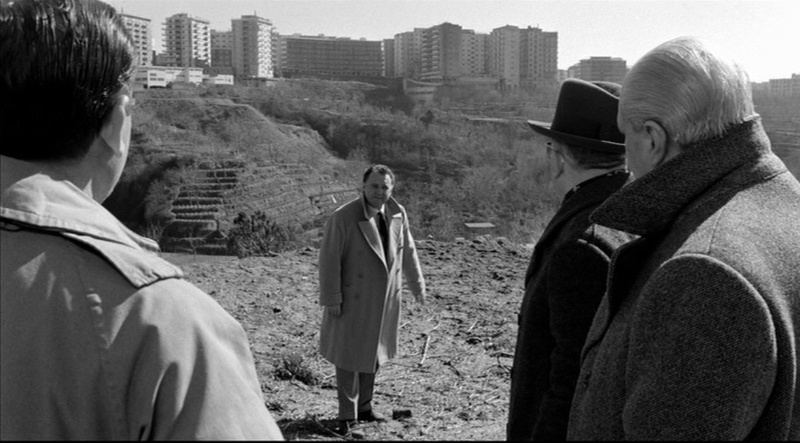 The key character is Eduardo Nottola This was Francesco’s Rosi’s third feature film and one of the films screened in the (Rod Steiger), a property developer but also a council member of the city. The film opens and closes on a development site which Nottola and his associates buy from the city for lucrative developments – ‘today’s gold’ in Nottola’s words. The corruption involved in land dealings becomes a major public issue when construction work in the poor quarter of the city causes the collapse of a Jerry-built block, with injuries and deaths. Much of the film is taken up with the manipulations and trafficking on the City Council. Here three groups jostle for power – right, centre and left. Apart from Nottola another key character is a leading left councillor De Vita (Carlo Fermariello), presented fairly sympathetically in the film. The other sympathetic councillor is Balsamo (Angelo D’Allessandro), the head of a hospital and member of the centre grouping. Less sympathetic and clearly prepared to endorse corruption and profiteering is Maglione (Guido Alberti), the leader of the right grouping and Professor De Angeli (Salvo Randone) the leader of the centre grouping. These members of the city’s ruling class dominate the film. The ordinary working people, objects of the exploitation and oppression appear only occasionally. However the film’s treatment of these episodes is powerful. 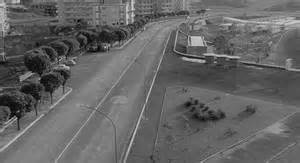 Right near the beginning of the film we see the collapse of the block of flats – the local people both run for cover and then run to attempt to rescue the injured and bring out the dead. We return to this area later when the council announces a plan to clear the area for development under the disguise of health and safety. The narrow street is filed with banners and the jeering populace. A little later the armed carabinieri back up council officials as the working class residents are forcibly moved. And then at the end of the film, in one of the bravura set pieces often found in Rosi’s film, we survey the city streets on the eve of an election. The camera moves around squares and arcades as the different political factions address, even harangue, crowds at hustings. What is noticeable about the scenes in the working class area is the prominence of women. In the sequence where opposition is voiced to the council plans women dominate the mise en scène. It is they who are in the forefront of agitation whilst the men are much more muted. Rosi’s films tend to focus on worlds dominated by men: in parts a reflection of the social reality of Italy. Strong and central women characters are uncommon, though they do appear, as in his version of Carmen (1984). But they do play a prominent part in the presentation of the working class: notable also in Salvatore Giuliano. Only one woman among the elite receives much attention, Maglione’s lover (Dany Paris). However she is treated rather like a pet and expected to follow him round, and be heard only when he wishes. The mise en scène in the film is rich in motifs. A recurring scene takes place in Nottola’s high rise offices. One wall is covered in a large-scale map of the city, reflecting his relationship to Naples. One of the later scenes takes place at night and the wide span windows present the darkened city as Nottola paces the room. The council sequences emphasise the nature of the political traffic in the city. The council chamber is frequently the site of hurly burly argument. But such occasions are constant interrupted as the different groups move to smaller, less public rooms where deals take place. As you might expect from the title ‘hands’ are also a recurring motif. Rosi’s film relies on a dynamic camera. The cinematographer is Gianni Di Venanzo, who worked on Rosi’s first five films. The film is full of sequence shots and at times the camera dashes towards events, at other times [as in Nottola’s office at night] it prowls round a character. 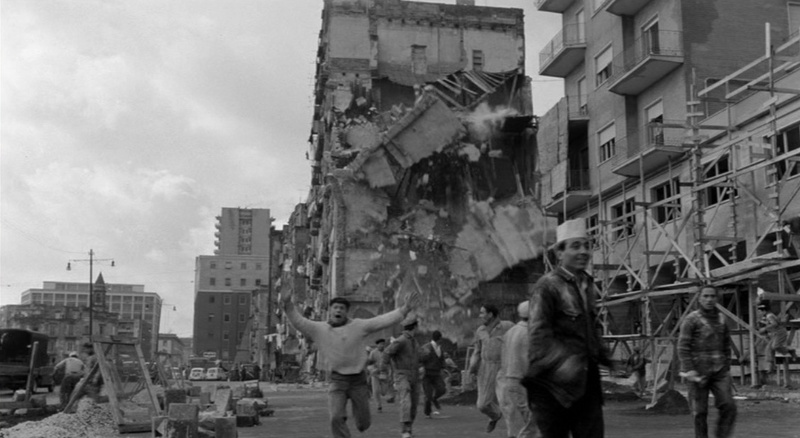 The collapse of the block of flats is a bravura moment in the film. Rosi and Venanzo filmed an actual demolition, using a number of cameras to record the event. The sequence shots in the night of hustings late in the film has a similarly impressive quality. The music by Piero Piccione is interesting. For much of the time the rhythm and tonal quality is reminiscent of films dealing with criminality. One sequence that accompanied the machinations of the councillors reminded me strongly of the compositions of Bernard Hermann. The cast presents this world of machinations and cover-ups very effectively. Rosi himself recruited Steiger for the main part. His rather different style make shim stand out in the councillors world. He is a maverick, yet dangerously effective. Other characters like Maglione and De Angeli seem as if taken from the writings of Machiavelli. Carlo Fermariello, playing Da De Vita, was actually a real-life councillor now playing his fictional counterpart. 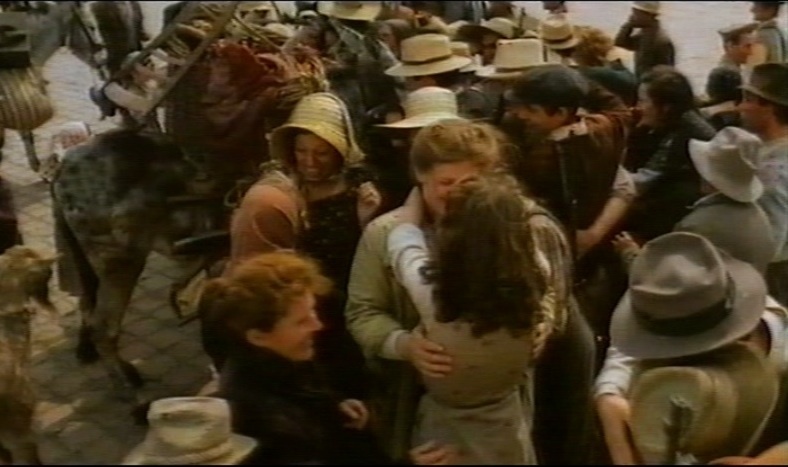 This mixing of the professional and non-professional performers is a recurring constant in Rosi’s films. And he and his production team are able to effectively weave these styles together. So several times we switch from the murky world of the council, predominantly professional performers, to the more dynamic world of the street, predominantly non-professional performers. Thematically the film deals with the corruption of the political class. 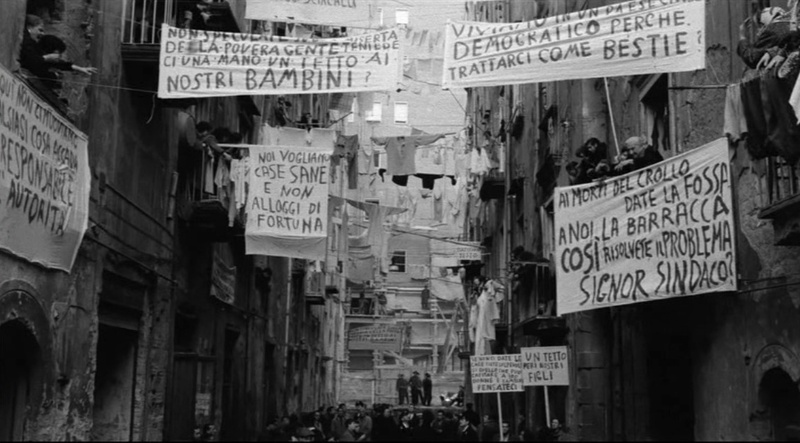 One assumes that whilst the film is fictional Italian audiences would easily draw parallels with the actual political events in Naples and in the wider Italy. The film uses the non-de plumes of ‘right’, centre’ and ‘left’, though some reviews identify actual: parties such as the Christian Democrats. This may be clearer in the original Italian than in the English sub-titles. What is clear is that when the film depicts the church it is the dominant Catholic institution in Italy. Religious leaders are not that prominent in the film, but they are always noticeable at points of public endorsement. Thus an opening ceremony for a development includes the blessing by a bishop or archbishop. Interestingly at one point De Angeli proudly shows off his art collection to Balsamo: these include not only two religious paintings but also an actual altarpiece installed in a side-room. No, no no. Don’t come and tell me this is how one should make movies. This is neither cinema nor healthy polemic; it is a political speech, an electoral harangue …. A wonderful film, Rosi has authored his most mature work. … It is a film essay with the clarity of a limpid and documented social study. Of course, the responses are more to do with the political; values of the reviewers than their review of filmic qualities. But in a way that speaks to the effectiveness of the film: its project is clearly delivered. The film won The Golden Lion at the Venice Film Festival that year. Like all of Rosi’s films it successfully straddles the popular and the art film – It is engrossing and at times exciting whilst also providing the viewer with stimulation and challenges. Poet of Civic Courage The Films of Francisco Rosi, edited by Carlo Testa, Flicks Books 1996. 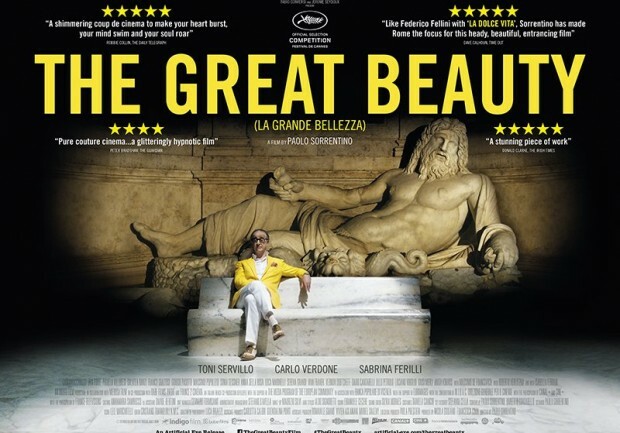 The Great Beauty / La grande belleza. This is the new feature by Italian director Paolo Sorrentino. Like his earlier The Consequences of Love (2004) and Il Divo(2008) this stars Toni Servillo. Here Servillo plays journalists and bon viveur Jep Gambardella. Jep is celebrating his 66th birthday and nearly forty years of both professional success and the enjoyment of being a leading light in the social circles of the Roman bourgeoisie. As the film develops we learn more about Jep, including flashbacks to a failed youthful romance. And we learn that after an initially critically successful first novel Jep has forsaken ‘art’ for journalism and celebrity. The film is full of images of Rome and also of the glittering but empty socialising of bourgeois celebrities and their acolytes. This immediately refers us back to Fellini’s great 1960 portrait La Dolce Vita. And there are strong parallels between Jep and the protagonist of Fellini’s earlier film, Marcello. Both are involved in journalism, though the new feature exclude the excesses of the paparazzi. Both appear to have opted for the shallow pleasures of celebrity culture rather than deeper emotional involvement. Both display a surface cynicism, which may mask more disquieting emotions. However, by the end of their respective films there is a clear divergence. Our final sight of Marcello is on a beach near Rome, where he watches a group of fisherman hauled in a monstrous strange fish. Then he sees a young girl, across an outlet of water, making signs. But he cannot understand her. We are left with Marcello’s puzzlement and a large close up of the young girl. Simple credits follow against a black screen. We leave Jep as we realise that, after a break of nearly forty years, he is starting to write a second novel. It will clearly be some sort of telling of the lost romance of his youth. The credits unroll against a slow tracking shot along the Tiber, under bridges and pass embankments. Marcello is left against the vast, grey and mysterious ocean. In Jep’s case we have an old-fashioned and [I think] somewhat romantic image of water. The Great Beauty is able to suggest a particular resonance because it is in colour rather than black and white. The texture of the river, and the green fonds in the current, give a particular feel to the palette of the image. There are parallel differences in the images of Rome that both films provide. Fellini’s film open with the impressive aerial shot of both Rome and a Christ-figure. Sorrentino’s introduction to Rome of the C21st down plays religion and suggests the Rome of the tourists. 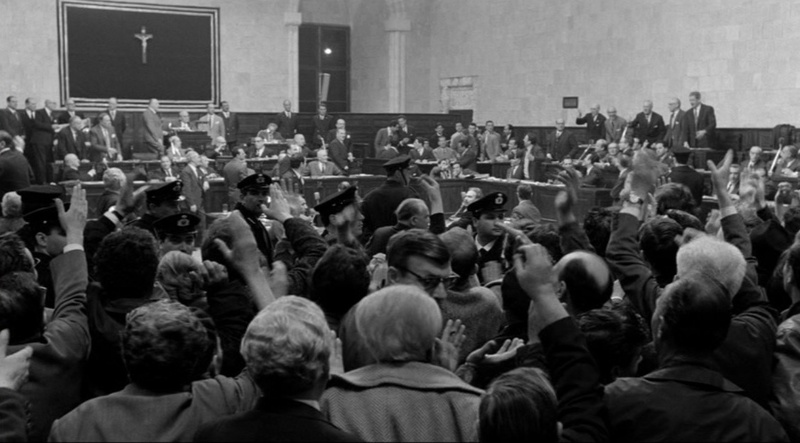 Equally the decadent parties we see in the Fellini film are shown in black and white and have a sharp acerbic feel. Sorentino’s parties are show in vibrant colour, with digital effects, and initially seem just like pop videos. This is the Italy of Berlusconi, some way from the late 1950s Rome of Fellini. The latter saw an ‘economic miracle’ that has eluded the media-savvy contemporary politician. Intriguingly Sorrentino’s earlier Il Divo presented a portrait of the politician Andreotti, whose career more or less spans the decades between La Dole Vita and Berlusconi. S&S suggested a ‘loose trilogy’ with these three films by Sorrentino, and given that The Consequences of Love deals with the Mafia, we have central institutions and players in Italy in the second half of the C20th. The Great Beauty seems to reference both cinema and the larger society. Another film that chronicles the changing relationship between the two is Cinema Paradiso (1988). And this would seem to provide another set of references in this new film. The flashbacks to the young romance reminded me strongly of Tornatore’s film. And in both films the older, jaded character displays a sense of change in response to the past. In The Great Beauty Jep is provoked by the widower of his lost love. And the voice over of the opening lines of Jep’s new novel at the closure reminded me forcibly of the montage of censored film images that closes Cinema Paradiso. Italy / Germany / Switzerland 2010. minutes, colour with [a few] subtitles. The title translates as ‘the four times’, and presents a pastoral cycle where dialogue is redundant and we see and hear people as they live and work. The film is set in a village in Calabria, at the lowest point of the Italian peninsula. This is place of wooded hills with the village set on a stark promontory and modern society seems a long way away. I loved this film, with its gradual pace, at times witty observation and obvious empathy for the place and the people. The sense of a cycle is created by the film opening and closing in a charcoal kiln. In between we meet an elderly goatherd. Every day he takes his flock to pasture in the hills, accompanied by his dog. The man has some ailment for which he takes a traditional remedy, partly religious. His illness results in the sheep dog guarding the goat pen in his absence which leads to a delightfully funny sequence as the villagers celebrate what is [apparently] Good Friday. Next we meet a baby goat born into the herd. On his first trip out into the hills the young goat strays and finally takes shelter under a tall tree as darkness falls. Later in the cycle the tree is felled, stripped and transported to the village where it is the focus of a traditional celebration. This includes young men demonstrating their virility climbing the pole. Finally the timber from the pole provides the centre of the fire in the charcoal kiln. The cycle carries on, man, animals and nature experiencing birth, death and rebirth. The film uses predominantly long shots and long takes, creating the sense of the slow, gradual change and development. There is much sound but it is the sounds of life and action rather than a spoken language that matters. I was completely absorbed by this simple observation of a particular and distinctive world. My only [mild] complaint was that whilst we know what has happened to the goatherd, the goat and the tree, we are left uncertain as to the fate of Vuk, the sheepdog. I hope he had a comfortable retirement home.